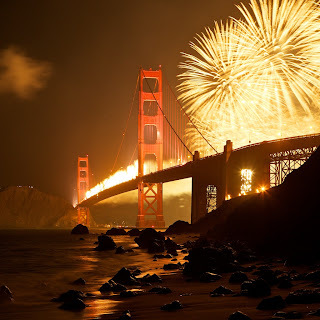 After feeling a rush of love toward my home city after the fireworks show, I decided we should travel into the city again the following day to take in some sights and soak up the love. We drove this time. 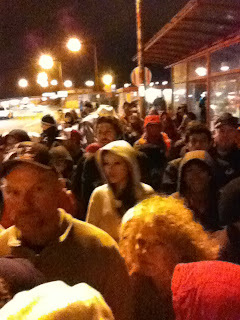 Fooled me once, Golden Gate Transit, shame on you. We picked up one of Leila's friends and had a tourist day. 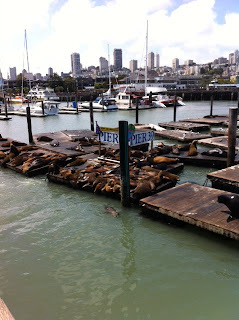 We went to Pier 39, the most touristy place in the whole city. In fact, if you are reading this and have never been to San Francisco and are planning a trip here some time in your future, do not go to Pier 39. SAVE YOURSELF! Except for the magnificent views of the bay, and the sea lions that sun themselves in the bay, Pier 39 has absolutely nothing to do with San Francisco. You will learn nothing about our city by going there, except that we will take your cash any way we can get it. I hadn't been there in 20 years, so we went, and in spite of the touristy shlock, we actually had a good time. Doesn't mean you should go there, though. One of the really great things about my husband is that when I get a wild hair that we should do something like this, he doesn't cheap out on me. He just knows that if we are going to the fair, or Pier 39, or some festival or public event, we are going to spend money, and that trying to save money during that kind of day is just annoying. So we park in the garage, we go to lunch, we buy the kids some souvenirs (in this case, mood rings) we get some fudge, I even bought a sweatshirt because I've been wanting a zip up hoodie. He doesn't balk, he just pays. (which is how I ended up with a $20 metal starfish.) I like that about him. When I was a kid, my parents might have taken me on an outing, once in a blue moon, but once there, I was never allowed to do any of the fun stuff like ride the double decker carousel, or tip the musician painted in silver, or get a funnel cake. It was kind of a bummer. But they also have a very comfortable retirement now, and that is a great gift to me, so maybe them buying me that ice cream cone would have meant me paying for their retirement home, so it was probably a good call. How about those sea lions, though? That's a never ending drama, right there. "Get off my pier! Stop pushing me! You smell! I'm trying to sleep! I don't want your stupid Amway!" At least that's how I translated there constant barking. Those guys have a lot to say. After the Pier, the kids wanted to go to the Hyatt Regency Hotel where they have these glass elevators that you can ride. You're not supposed to ride them, and you can only get on if you have a key card, but we dangle around the elevator lobby for someone to get off the elevator and then we sneak on and go wild. I used to love this hotel when I was a kid, too. It must be genetic. Also, Leila loves the name. She says, "Its so fancy, like, Hyatt." They had a ball. They kept checking their mood rings which vacillated between being "calm" and "in love" The latter made them blush. So long, Pier 39! See you in another 20 years! The other day I was waiting with a friend in her car, picking Leila up from school. Another friend joined us at the driver's side window and we did what moms do: engaged in juicy gossip. I know, we should be above it, we should all be beacons of forgiveness and understanding. But you know what? Eff it. Just as we were getting to the good part, here comes Leila, bounding up to the car. We had to stop mid story. So, genius mother that I am, I say to Leila, "Hey! Go over to the after care place and see if your little friend can come over for the afternoon!" Leila looks at me confused. This is unprecedented. Sending her back onto the school grounds to go get a friend for an un-planned play date? Well, okay then! She runs off, back toward the school, and I get to hear the rest of the story. And it was a good one. But I'm not going to tell you what it is because I'm above all that. My payment for this act of awesome parenting was to have two girls giggling the afternoon and evening away, getting them pizza, and finding her friend's pants in my bed after we brought her home. Totally worth it. I had an intense craving for french toast this morning. I am feeling sullen and bruised and crabby, and french toast seemed like the only way to save the day. I fought it for a while, and my friend suggested I go to the grocery store for some bananas so I could make a healthy smoothie. Has she met me? Is she high? Doesn't she know that the grocery store is the worst place in the world besides the dentist's office?? So I decided, eff it, I'm going for french toast. I went to the little place around the corner from me, and I sat down at the counter and the nice lady said, "French toast with sour dough?" and I said Yes please, and then I thought about this: Is this just the charming feature of small town life, where the purveyor of fine breakfast items knows exactly what I want when I sit down? Or does it indicate that eating french toast, alone, and that I am known for this means that I have a problem I should explore? Is this akin to drinking, alone, in the morning? Hello, My name is Bored, I'm a french toast addict. Hi, Bored! Seriously, it felt like I had gone into a bar at 9:30 in the morning and ordered a bourbon and water, hold the water. And I don't even like bourbon. I decided to order a smoothie too, though, so I got the menu back and chose something with orange juice. And you know what? It worked! I actually feel better now. They say exercise makes you feel better, and I had taken a long walk with the dog before breakfast, but the only thing that made me feel better was delicious french toast. See? No need for endorphins, just maple syrup. So, you guys, since my remodel is done, and my job is over, and I'm winding down my PTA duties, I don't have a lot to do. I have to come up with stuff to do during the day to pass the time, and I try to make those things meaningful instead of frivolous, but sometimes I fail at that. I could pass my time doing chores and cleaning the bathroom and stuff, but mostly I just read books and hang out. One of the things that has been happening is that, during lunch time, which is usually around 1:30 (I'm a late breakfast eater) I turn on the TV to see what's cookin'. Literally. I often watch the food network. But at 2:00 on the Bio channel, Celebrity Ghost Stories comes on. People of the internet, I know how ridiculous this sounds. I was flipping channels one day, and Joan Rivers was talking about a ghost, and then some guy from Sopranos, and then C. Thomas Howel, and before I knew it, I was watching and looking forward to Celebrity Ghost Stories every single dingle day. At first I was all, I like it, but its not like I'm gonna DVR it or anything. But that turns out not to have been true because I have an episode waiting on my DVR for me RIGHT NOW Its haunting me. Ha ha ha. I freakin' love this show. Its supremely stupid, but it has all the elements I like in a show: it is produced in small little bites, like three or four celebrities per show, so you don't really miss anything if you start in the middle. It has C and D list celebrities, some I haven't even heard of. There seem to be different categories of stories, some are simple post-death visitations that never happen again, some are spirits that live in the house all the time and are like family. The show has weird sounds and screams and camera tricks that make it freaky enough that I probably wouldn't watch it if I was home alone at night. Like, in the Loretta Lynn episode, they show a pond, but they color it all yellowish and wiggle the camera around, and then show a riderless white horse, and add some interference in there, and its awesome. This is a video I took from my TV. Its not from Celebrity Ghost Stories, but its about ghosts. Sorry for the poor sound quality, I'm low tech. To see the real version, click here.